An international team led by Princeton University scientists has discovered Weyl fermions, an elusive massless particle theorized 85 years ago. The particle could give rise to faster and more efficient electronics because of its unusual ability to behave as matter and antimatter inside a crystal, according to new research. The researchers report in the journal Science July 16 the first observation of Weyl fermions, which, if applied to next-generation electronics, could allow for a nearly free and efficient flow of electricity in electronics, and thus greater power, especially for computers, the researchers suggest. Proposed by the mathematician and physicist Hermann Weyl in 1929, Weyl fermions have been long sought by scientists because they have been regarded as possible building blocks of other subatomic particles, and are even more basic than the ubiquitous, negative-charge carrying electron (when electrons are moving inside a crystal). Their basic nature means that Weyl fermions could provide a much more stable and efficient transport of particles than electrons, which are the principal particle behind modern electronics. Unlike electrons, Weyl fermions are massless and possess a high degree of mobility; the particle's spin is both in the same direction as its motion—which is known as being right-handed—and in the opposite direction in which it moves, or left-handed. 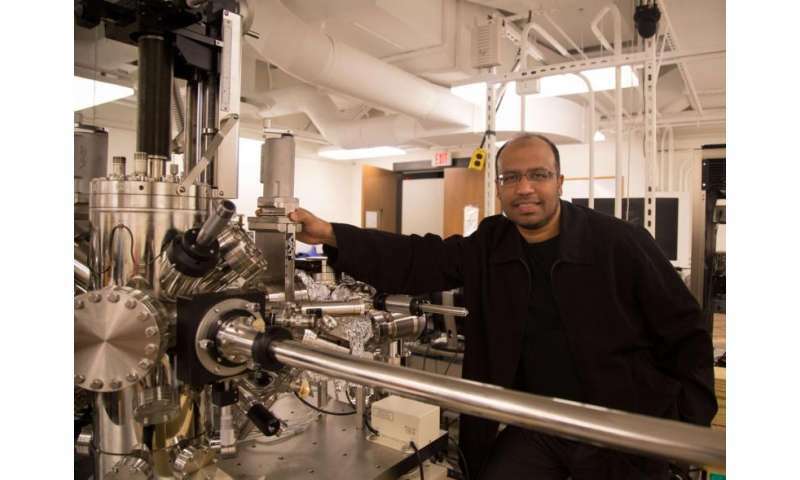 "The physics of the Weyl fermion are so strange, there could be many things that arise from this particle that we're just not capable of imagining now," said corresponding author M. Zahid Hasan, a Princeton professor of physics who led the research team. 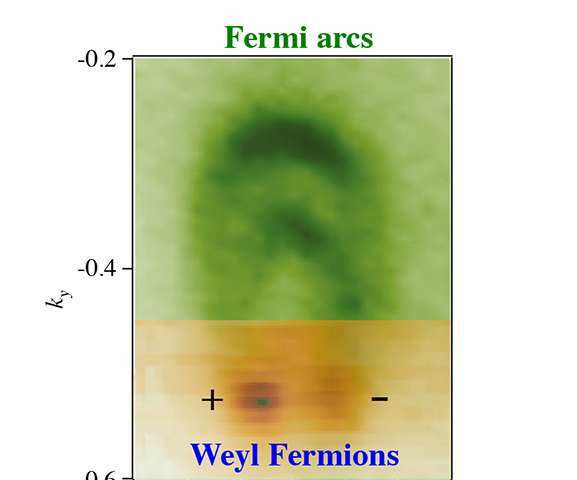 The researchers' find differs from the other particle discoveries in that the Weyl fermion can be reproduced and potentially applied, Hasan said. Typically, particles such as the famous Higgs boson are detected in the fleeting aftermath of particle collisions, he said. The Weyl fermion, however, was discovered inside a synthetic metallic crystal called tantalum arsenide that the Princeton researchers designed in collaboration with researchers at the Collaborative Innovation Center of Quantum Matter in Beijing and at National Taiwan University. The Weyl fermion possesses two characteristics that could make its discovery a boon for future electronics, including the development of the highly prized field of efficient quantum computing, Hasan explained. For a physicist, the Weyl fermions are most notable for behaving like a composite of monopole- and antimonopole-like particles when inside a crystal, Hasan said. This means that Weyl particles that have opposite magnetic-like charges can nonetheless move independently of one another with a high degree of mobility. The researchers also found that Weyl fermions can be used to create massless electrons that move very quickly with no backscattering, wherein electrons are lost when they collide with an obstruction. In electronics, backscattering hinders efficiency and generates heat. Weyl electrons simply move through and around roadblocks, Hasan said. "It's like they have their own GPS and steer themselves without scattering," Hasan said. "They will move and move only in one direction since they are either right-handed or left-handed and never come to an end because they just tunnel through. These are very fast electrons that behave like unidirectional light beams and can be used for new types of quantum computing." Prior to the Science paper, Hasan and his co-authors published a report in the journal Nature Communications in June that theorized that Weyl fermions could exist in a tantalum arsenide crystal. Guided by that paper, the researchers used the Princeton Institute for the Science and Technology of Materials (PRISM) and Laboratory for Topological Quantum Matter and Spectroscopy in Princeton's Jadwin Hall to research and simulate dozens of crystal structures before seizing upon the asymmetrical tantalum arsenide crystal, which has a differently shaped top and bottom. The crystals were then loaded into a two-story device known as a scanning tunneling spectromicroscope that is cooled to near absolute zero and suspended from the ceiling to prevent even atom-sized vibrations. The spectromicroscope determined if the crystal matched the theoretical specifications for hosting a Weyl fermion. "It told us if the crystal was the house of the particle," Hasan said. The Princeton team took the crystals passing the spectromicroscope test to the Lawrence Berkeley National Laboratory in California to be tested with high-energy accelerator-based photon beams. Once fired through the crystal, the beams' shape, size and direction indicated the presence of the long-elusive Weyl fermion. First author Su-Yang Xu, a postdoctoral research associate in Princeton's Department of Physics, said that the work was unique for encompassing theory and experimentalism. "The nature of this research and how it emerged is really different and more exciting than most of other work we have done before," Xu said. "Usually, theorists tell us that some compound might show some new or interesting properties, then we as experimentalists grow that sample and perform experiments to test the prediction. In this case, we came up with the theoretical prediction ourselves and then performed the experiments. This makes the final success even more exciting and satisfying than before." In pursuing the elusive particle, the researchers had to pull from a number of disciplines, as well as just have faith in their quest and scientific instincts, Xu said. "Solving this problem involved physics theory, chemistry, material science and, most importantly, intuition," he said. "This work really shows why research is so fascinating, because it involved both rational, logical thinking, and also sparks and inspiration." Weyl, who worked at the Institute for Advanced Study, suggested his fermion as an alternative to the theory of relativity proposed by his colleague Albert Einstein. Although that application never panned out, the characteristics of his theoretical particle intrigued physicists for nearly a century, Hasan said. Actually observing the particle was a trying process—one ambitious experiment proposed colliding high-energy neutrinos to test if the Weyl fermion was produced in the aftermath, he said. The hunt for the Weyl fermion began in the earliest days of quantum theory when physicists first realized that their equations implied the existence of antimatter counterparts to commonly known particles such as electrons, Hasan said. "People figured that although Weyl's theory was not applicable to relativity or neutrinos, it is the most basic form of fermion and had all other kinds of weird and beautiful properties that could be useful," he said. "After more than 80 years, we found that this fermion was already there, waiting. It is the most basic building block of all electrons," he said. "It is exciting that we could finally make it come out following Weyl's 1929 theoretical recipe." Ashvin Vishwanath, a professor of physics at the University of California-Berkeley who was not involved in the study, commented, "Professor Hasan's experiments report the observation of both the unusual properties in the bulk of the crystal as well as the exotic surface states that were theoretically predicted. While it is early to say what practical implications this discovery might have, it is worth noting that Weyl materials are direct 3-D electronic analogs of graphene, which is being seriously studied for potential applications." Who's gonna say anything bad about NJ now? As long as you mention deficits, double parking, Jersey dividers ... we're good. But seriously nice job Dr. Hasan and team!!! I mean spin depending of direction of motion rather than momentum. Interesting. There is something like that in classical theory of waves namely polarization of the wave which could change as measured, from right handed to left handed under the Doppler shift effect, while in frame of reference of the motion it is unchanged. Maybe I am missing but in this post there is nothing concrete to rely on. Again one must pay to read the original paper, to learn anything useful. That a shame. I am always skeptical about subparticles because to me it is just introduction of another, new abstract level to explain other previously inexplicable abstract level. There seem to be other ways to try to "explain" many of those inexplicable issues of Quantum Mechanics as I found below. But maybe, just maybe no explanation is even needed. Good observation. It turns out that the actual paper points out it is a "quasiparticle" not an actual particle. Not too long ago, Phys.org reported on finding 'Majorana particles,' but that *also* turned out to be a quasiparticle observation. No actual Majorana particles have been seen to date. Apparently this is exactly the same situation: they're finding locations in a lattice which seem to have properties *like* Weyl fermions. But they haven't seen Weyl fermions. For engineers, perhaps the distinction is moot - if they can manipulate these quasiparticles, they might be able to engineer stuff with them. But for theoretical physicists, the distinction is anything but moot. Many of those quasi particles are just a logical shortcuts. Just like so called "vacants" i.e. missing ions in the metal lattice or holes (locations of missing electrons) in pn junction. Factually, they do not exist i.e. they are massless like Weyl fermions but by dealing with them experimentally and theoretically is often a lot easier. That illustrates power of interpretation of the results experiments in any way we want them. Article about the other team before it get lost..
"Every single paper written about Weyl points was theoretical, until now," says Marin Soljači, a professor of physics at MIT and the senior author of a paper published this week in the journal Science confirming the detection. (Another team of researchers at Princeton University and elsewhere independently made a different detection of Weyl particles; their paper appears in the same issue of Science). Weyl points and Weyl particles are not the same thing, zoljah. Docile, you are totally, 100% wrong. Again: quasiparticles are not particles. You might at least read Wikipedia to catch yourself up. You've got a great gaping hole in your knowledge of basic physics. Thinking like that in Physics leaves people chasing "Fictitious Forces" and calling them "Dark Something" for 80 years. docile sounds like a charlatan but I might be wrong, I'm not a physicist. That's a little hyperbole don't you think? Anything regarding the distinction between quasi particles and "regular" particles is NOT basic physics. Generally when we find "new" particles, they are quasi particles. What this means is that in some material, we can create some specific field theory to describe that material, and in that field theory, there are solutions that behave like particles do in the "fundamental" quantum field theories describing things like quarks and electrons. Returners: I don't think you mean the same thing when you say "fictitious force" as physicists do. The meaning, in physics, is that it is a force that appears mathematically when in a non-inertial reference frame (eg, in a turning car there feels to be a "centrifugal force." There's no actual force pushing you outwards to the door, but it feels like it because the frame you're in (a rotating one) is non-inertial). Procletnic: docile is a.... to be kind "promoter of explanations that exist outside of science" I wish we could have flags on PO for the various commenters and what ideas they're trying to sell on here. shavera wrote, "Generally when we find "new" particles, they are quasi particles." It's made explicit in the studies whether they found real particles or quasiparticles. Where we run into problems is when science journalists don't understand the difference and therefore fail to communicate it. Over at the LHC, the Higgs Bosun, the Penaquark, and other particles being discovered are absolutely *not* quasiparticles. What is it with phys.org and the avoidance of the term "quasiparticle"? Is it blacklisted, to hard to type? What is it that prevents them from ever using it? Because, at some level, it requires an understanding of quantum field theory to know what the term means. There's a big problem in science that when scientists use a word, lay people may use the same word but the word is mapped to an entirely different meaning (see the totally false discussion of "fictitious forces" above). To just say "quasiparticles" doesn't really tell the average reader much. What would be more ideal is if we had better understanding that there are "elementary particles" (electrons, quarks), "composite particles" (protons, muons, positronium), and "quasiparticles" (particulate excitations of effective fields). But it's hard to communicate that effectively without repeating it in every article, so secondary authors tend to simplify the whole concept to "particles." Did ya hear about the Senator that tried to dabble in Science without any guidance and came away thinking that Viagra works because of Fermions? A little news for you, and all: It's a holographic universe, and time is an illusion and there are no facts. Facts are a projection of the human mind, just like mathematics. math is a decent curve fit, most times, but it's still, fundamentally, a human projection. Just so you know. or, perhaps will allow yourself to know when you cease projecting the rest and begin to think in serious terms and ways.